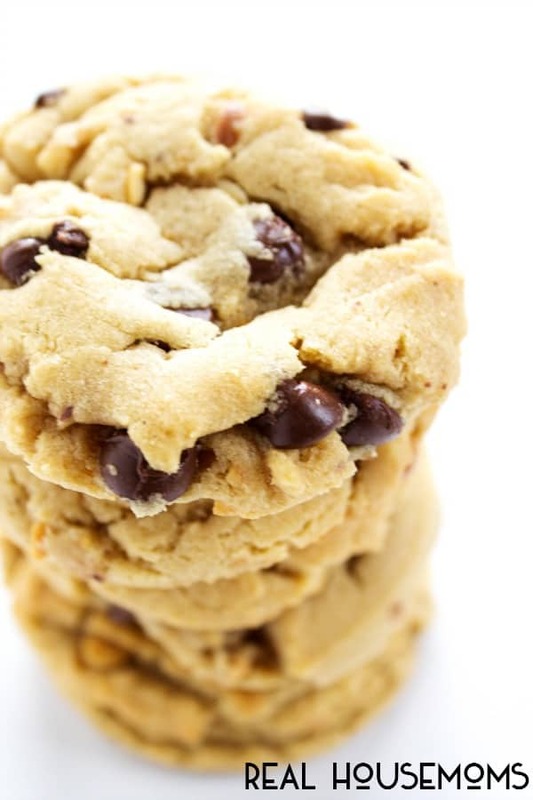 These Chewy Chocolate Chip Peanut Butter Cookies are absolute perfection! Get ready to devour a dozen or two, then make another batch to share with all our your friends! I love having homemade cookies for my kids after school. I don’t know but there is something special about a homemade cookie in the cookie jar. And while I don’t let them eat but one (or two on a special days) it is still just something comforting to me. Maybe it is that my mom made cookies with us growing up, so it just is nostalgic. 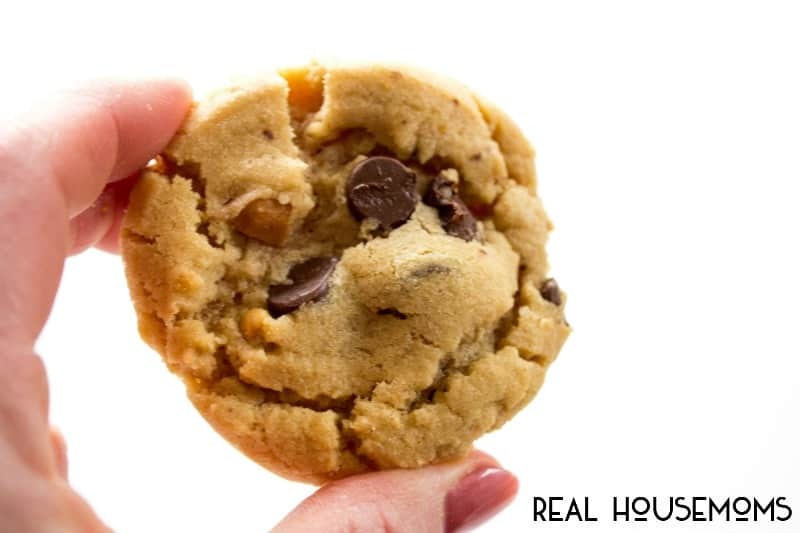 But either way there is nothing more like a warm, fresh cookie form the oven to brighten just anyone’s day. I love it when the kids come home and we sit at the table and talk about their day over a cup of milk and a fresh homemade cookie. 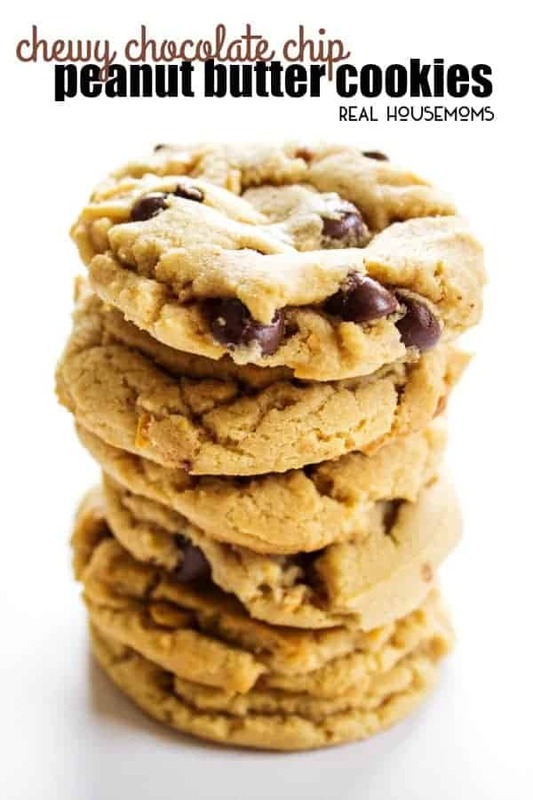 And since all of us love chocolate chip cookies and well peanut butter is a staple in our home it is no wonder that these Chewy Chocolate Chip Peanut Butter Cookies are one of their favorites. 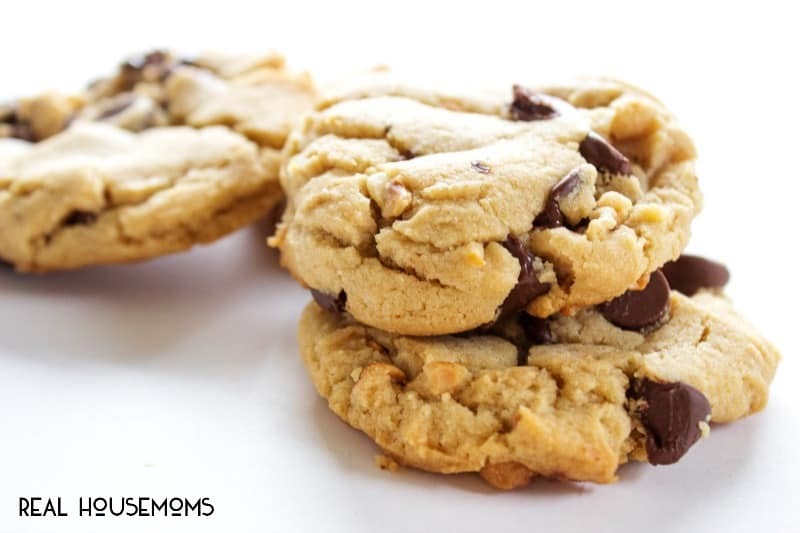 I love making different variations of chocolate chip and peanut butter cookies, two of my favorites I have shared at the bottom, but really these Chewy Chocolate Chip Peanut Butter Cookies are in my top 3! Which is pretty big for me to say being I would consider myself a cookie master. What are some of the things that you like to do with your kids after school – that get them to sit and talk with you at the end of the day? I find that this is harder the older they get, so starting this mommy & me time over a cookie and glass of milk, has really bonded us and created a routine which has made it a bit easier to keep these conversations going the older they get. I mean who really would turn down a cookie? So far my kids haven’t and I hope they never, ever do. Because I love, crave this time with them. And who knows someday I may be lucky enough to do this with my grandkids every once in a while too! 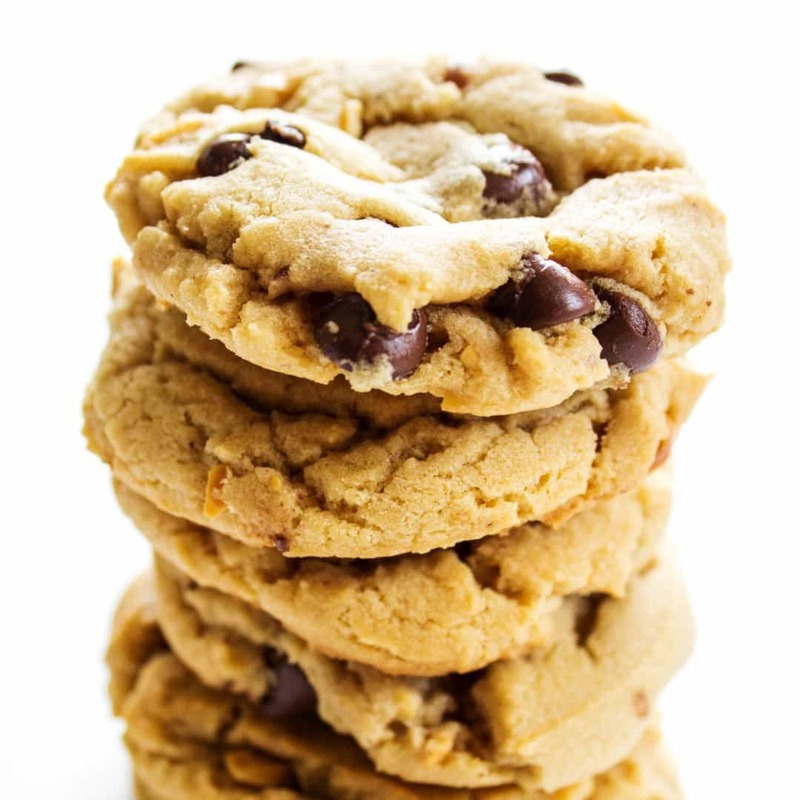 Enjoy these Chewy Chocolate Chip Peanut Butter Cookies from our cookie jar to yours. 1 1/4 cup chocolate chips I used semi-sweet but dark chocolate is good too! Preheat the oven to 350 F. Line 2 baking pans with parchment paper or a silicone mat.. In a large mixing bowl, cream together the peanut butter, butter, sugar and brown sugar. 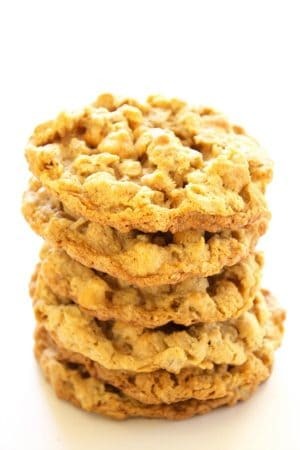 Beat together until smooth & creamy best if using a stand mixer or hand mixer. Add the egg and vanilla extract and continue to mix until well combined. Using a cookie dough scooper or making the dough into 1 inch balls. Roll in white granulated sugar if you desire and place onto your prepared baking sheet. Using a fork, press down on each ball of dough to slightly flatten and creating a criss-cross pattern. Bake for 8-9 minutes. Let cool on the baking sheet for a few minutes and then transfer to a wire rack. These keep well for a couple of days in an airtight container. I was afraid to try these because I couldn’t find any reviews but I’m sooo glad I made them. They are delicious!!! Thank you so much for sharing this recipe. 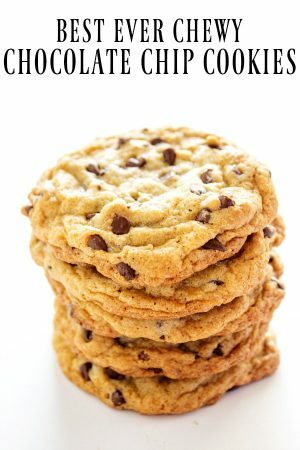 Easy to make, delicious cookies! Don’t be put off by the lack of reviews–these are great! I have made all of the cookies & they are all yummy. My didn’t like these cookies. I followed the recipe exactly. The cookies had a crumbly, dense texture and overly sweet flavor. Nobody asked for seconds and the remainder just went stale and were finally chucked. I’m sorry to hear they didn’t work out as well for you, usually they are a hit!! I wonder if it has anything to do with the climate or altitude you live in, sometimes that changes things. I added about 1/4 cup of shortening and added an extra egg yolk and they were much more chewy than the first time I made them. Still a great recipe even without adding those. Great! Thank you so much, Riley.